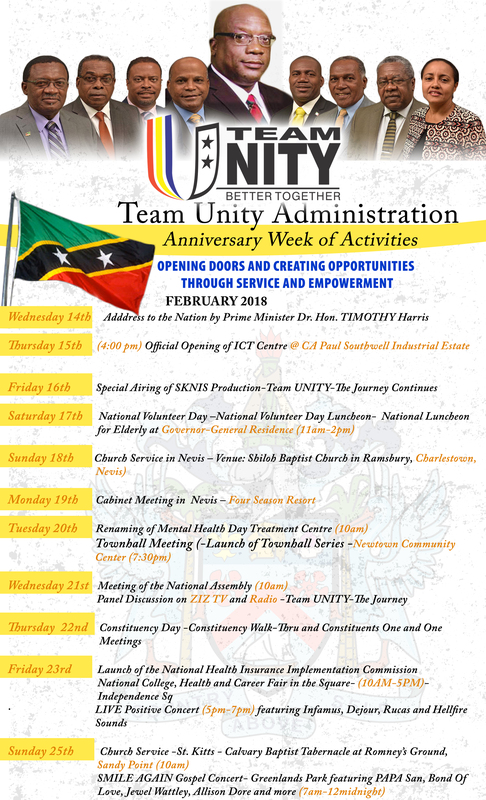 Basseterre, St. Kitts, February 13, 2018 (SKNIS): The Team Unity Administration under the leadership of Prime Minister, Dr. the Honourable Timothy Harris, will be celebrating its third anniversary with an extended week of activities under the theme: “Opening Doors and Creating Opportunities Through Service and Empowerment”. During the sitting of National Assembly on Tuesday, February 13, Prime Minister Harris updated the general public on some of the successes of his administration over the years. “Our Team Unity Administration has kept faith with our people, giving dutiful and unwavering service to all the people of St. Kitts and Nevis,” said Dr. Harris. “Three years into our first five-year mandate the Government of National Unity has successfully opened the doors of a number of projects that are ground breaking and pioneering for our country,” Prime Minister Harris added, noting that St. Kitts and Nevis has received accolades from all walks of the globe as one of the best managed small island states. Some of the projects include but are not limited to the Federation’s first Mental Health Day Treatment Centre, the first Cancer Care Treatment Centre at the Joseph N. France General Hospital, as well as the first commissioning of the Traffic Lights in Basseterre. The anniversary, which runs from Thursday, February 15 to Sunday, February 25, includes two church services, one to be held on Nevis while the other is slated for St. Kitts. Other activities include a Gospel concert; a national volunteered day; as well as a health and career fair. The official reopening of the National ICT Centre also forms part of the extended week of activities. Also important is the launch of another series of Town Hall Meetings which gives the public a chance to engage with the ministers, be updated on public policy and make suggestions on various matters of national interest.